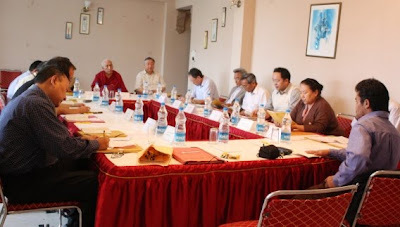 The Tibetan Task Force on Sino-Tibetan dialogue process began a two-day meeting here this morning. Tibetan Prime Minister Samdhong Rinpoche is presiding over the meeting attended by Task Force members, which include His Holiness the Dalai Lama's special envoy Kasur Lodi Gyari and envoy Kelsang Gyaltsen. This is the 22nd meeting of the Task Force and the second one after talks between Dharamsala and Beijing resumed in January this year, after almost fifteen months' standoff. The last meeting was held in March this year. The body comprising of Tibetan ministers, Dalai Lama's envoys and government officials was formed in 1999 to assist the process of dialogue with the Chinese government. After the lecture, Fu was met briefly by Mr Penpa Tsering, the Speaker of the Tibetan Parliament-in-Exile, who attended the lecture session at the NUPI with Mrs. Chungdak Koren from the Norwegian Tibet Committee. In his comment to VOT, the Tibetan speaker remarked that that Fu Ying had sounded genuine and considerate in her comments on Tibet issue. He also said that the Chinese vice foreign minister even refrained from either denouncing the Dalai Lama or calling him a separatist. Could be a good sign, could just be more meaningless words from a government which has been entirely disingenuous in the past. At the very least we should hear about when the next round will begin some time soon.